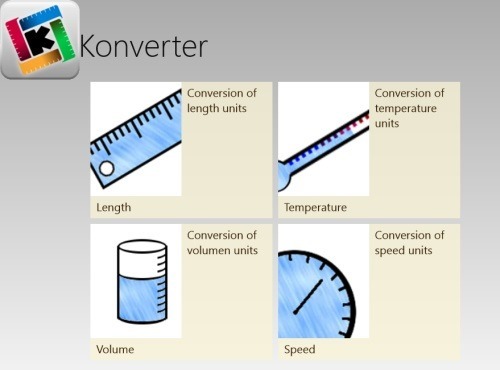 Konverter is a free Windows 8 unit converter app available under ‘Tools’ section of its app store. 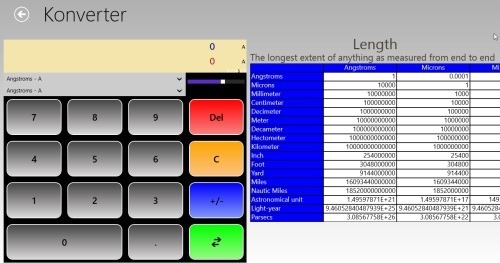 This unit converter Windows 8 app lets you convert most common units of measurement to another in just a couple of seconds. The app comes with four different categories of units: Length, Temperature, Volume, and Speed. Each category has a list of sub-units. You just need to select the input unit and the output unit, once done just start converting the values. The unique part about this unit converter app for Windows 8 is that it comes with a table that displays each unit converted to rest of the given sub-units. The app comes in different languages such as English, Portuguese, Italian, and Spanish. You can select a language in which you want to use this app. Also, you can select the amount of precision for eight digits which you can change according to your preferences. It’s very easy and simple to use Konverter Windows 8 app. Let me quickly point out the main features of this Windows 8 unit converter app below. Lets you convert values from one unit of measurement to another, in just a couple of clicks. There are four different categories of units: Length, Temperature, Volume, and Speed. Each category comes with a list of sub-units. Comes with a table that displays each unit converter to rest of the given sub-units. Comes in four languages: English, Portuguese, Italian, and Spanish. Lets you select the amount of precision for eight digits. Well.. I really liked this advanced units converter app where you can not only convert from one unit to another but also see a table, comes in four different languages, choose the amount of precision.. just everything you would expect from an advanced unit converter. Also, check out our posts on Currency Converter Apps, BMI Calculator Apps, and Unit Converter Apps. Click on ‘View in windows store’ to open the app in Windows 8 app store. Now, you can click on ‘Install’ button to download the app now. In short, Konverter is a good utility Windows 8 unit converter app to converter between two or more units of measurements. Go ahead and download Konverter app in Windows 8 now. I’m the developer of Konverter. May thanks for the review, and all feedback are welcomed. I’ve just released a new version (1.2) with more units.